The 90s gave us some of the greatest films of all time, but some of them hide some pretty surprising secrets. Here’s 8 things you didn’t know about some classic 90s films! One of the coolest moments in the impossibly cool Pulp Fiction is when Samuel L Jackson quotes a passage from the Bible, Ezekiel 25:17, before laying waste to a group of burger-munching lowlifes. Don’t bother trawling the Bible for the passage, though, because it doesn’t actually exist. Yep, Quentin Tarantino almost completely made it up. The sections about the righteous man and the shepherd are Tarantino’s own work, although the ‘And I will strike down upon thee with great vengeance and furious anger’ part is nearly right; the Bible actually says ‘And I will execute great vengeance upon them with furious rebukes’. Nevertheless, Jackson delivers the passage with such conviction that a lot of people genuinely believe it is part of the holy book, rather than the work of a screenwriter. 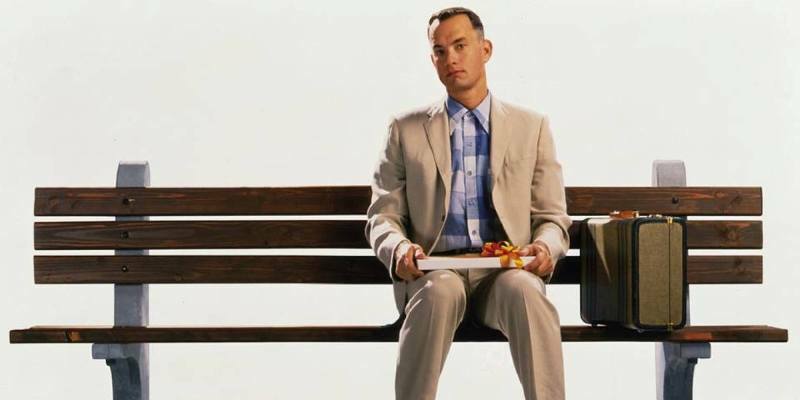 It’s hard to imagine anyone but Tom Hanks playing Forrest Gump (he won an Oscar for his performance, after all), but it very nearly didn’t happen. In the first 45 minutes of The Matrix, Keanu Reeves asks 44 questions – about a question a minute. It is pretty confusing, to be fair. Bonus fact: Nicolas Cage turned down the role of Neo because of family commitments. How different that film would have been. Braveheart is widely considered one of the best historical epics of all time, despite the fact most of it is entirely fictional. Firstly, William Wallace’s nickname wasn’t ‘Braveheart’. That honour actually belonged to another Scottish hero, Robert the Bruce. It’s also suggested that Wallace has an affair with Isabella, Princess of Wales. However, she was only 9 when Wallace was executed. By the time her son Edward III (whom the film suggests Wallace could have fathered) was born, Wallace had been dead for nearly 10 years. The movie goes beyond historical inaccuracy too. One of the Wallace’s most famous quotes, ‘every man dies – not every man lives’, was actually something William Wallace said – except it was William Wallace the 19th century American poet, rather than the Scottish freedom fighter. Mel Gibson has admitted the film was mostly fictitious, and we’re sure it doesn’t bother him greatly when he looks at the Best Film Oscar on his mantelpiece! The Wildebeest stampede scene in The Lion King lasts just over 2 minutes but took 3 years to make. Among other things, a new computer program had to be written just to make sure the animals could run without colliding into each other. Presumably, the animators were fighting back the tears like the rest of us too. Joe Pesci isn’t a renowned method actor like his Goodfellas co-star Robert De Niro, but even Bob would admire Pesci’s sterling efforts at being really nasty to Home Alone co-star Macaulay Culkin. In order to build distance between the two and make himself scarier, Pesci deliberately avoided Culkin on set. When they eventually did meet, Pesci bit Culkin’s finger so hard that he left a scar (fortunately, that was an accident!). Apparently, Pesci kept saying the ‘F’ word too, presumably forgetting he was making a family film instead of Goodfellas. Director Chris Columbus encouraged him to use the word ‘fridge’ instead. Yep, Smith balanced filming Clerks with his day job in the store. He worked from 6am to 11pm, and then immediately started shooting until around 4am. He’d then get a couple of hours of sleep before going to work again. Oh, and he had to act as Silent Bob too. Luckily, it all paid off and we imagine he never had to work in a grocery store again. The Blair Witch Project may be fictional, but its main actors went through hell to make it look as realistic as possible. We’re fairly some employment laws were broken in the making of the film: for one, the poor actors didn’t know what was going to happen at any point. Their reactions during the ‘tent shaking’ scene are real, because they genuinely didn’t know the director was going to shake the tent at that point. To make matters worse, the directors decided to increase tension between the group by giving the actors less and less food. The gang were also pretty much left to their own devices in the woods, leading them to get lost at least 3 times; there’s even a scene in the film where the characters moan about having walked south all day only to end up in the same place. It paid off, though: filmgoers across the globe were duped, with some people even sending Heather Donahue’s mother condolences for the loss of her daughter. Share your favourite 90s movie facts with us in the comments! Planning to clear out your DVDs? Get an instant price and sell your DVDs with musicMagpie today!